Can charge Three Mobiles/Devices Together.Easly share your charger with friends and family. Whether you are at home/office or flying around the world, the Flow AC-USB Plug with 3 USB Port is the perfect solution to charge your gadgets. 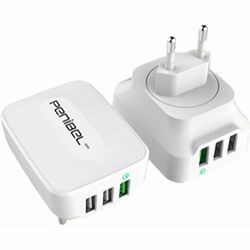 This adapter allows you to charge Tablets, Smartphone, Bluetooth headset, Mp3 player, Portable Speakers and all other 5V devices at the same time. This adapter comes with elegant glossy look. It's truly portable & easy to carry. Put it in your pocket or your briefcase and take it everywhere you go. This adapter converts normal AC output to dual USB outputs, 5V/3A Both outputs if used will give 1A in both sockets. This Adapter comes with overload and Short circuit protection. Suitable for charging tablets, mobiles, GPS etc. Whether you are at home/office or flying around the world, the Flow AC-USB Plug with 3 USB Port is the perfect solution to charge your gadgets. This adapter allows you to charge Tablets, Smartphone, Bluetooth headset, Mp3 player, Portable Speakers and all other 5V devices at the same time. This adapter comes with elegant glossy look. It's truly portable & easy to carry. Put it in your pocket or your briefcase and take it everywhere you go. This adapter converts normal AC output to dual USB outputs, 5V/3A Both outputs if used will give 1A in both sockets. This Adapter comes with overload and Short circuit protection. Suitable for charging tablets, mobiles, GPS etc.